Clonganny House is a glorious Georgian gem nestled in the heart of the beach area of north Co. Wexford. Minutes from the stunning seaside and beaches at Cahore, Old Bawn, Ballinoulart and Morriscastle; the villages of Ballygarrett and Kilmuckridge and just 15 minutes from the busy market town of Gorey. Beautiful and tastefully decorated, Clonganny House is a luxury B&B, exclusively for adults, offering stylish accommodation and delicious food. The elegant and romantic en-suite rooms are located around the courtyard, in converted stable and coach house buildings. Each one is individually designed and fitted out to the highest standard and opens out to a delightful walled garden where guests can sit and enjoy the peaceful and serene space. 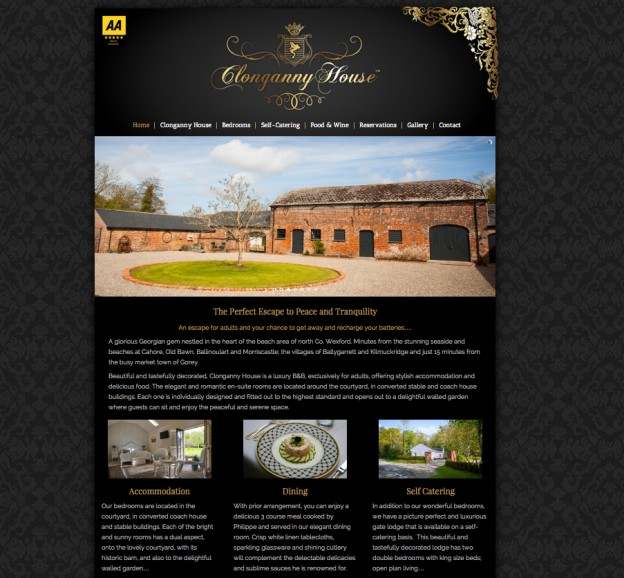 Clonganny House web design has a bespoke look tailored and programmed to exacting standards. 2Cubed worked with Philippe and Brona to help showcase the delights of Clonganny House, highlighting the luxury to be found in this gorgeous Wexford B&B. This entry was posted on May 28, 2015 by admin.